In this action-packed climax to a classic espionage trilogy, the heroes of The Brotherhood of the Rose and The Fraternity of the Stone are drawn together to solve a baffling mystery: Why have ten elderly men from around the world been kidnapped, all at the same time? As these brilliant operatives investigate, they are pulled into a violent cycle of revenge that stretches back to World War II—and is now forcing sons to pay for their father's darkest sins. David Morrell's international thrillers have no equal. 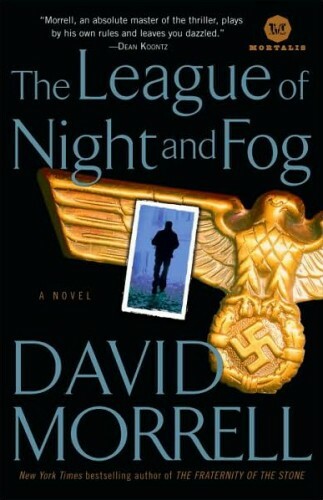 From the Vatican to the Swiss Alps, from Australia to the heartland of America, The League of Night and Fog brings together two generations bound by one chilling legacy. The current Mortalis edition from Ballantine contains a bonus short story,"The Abelard Sanction," that continues the Brotherhood of the Rose saga. "David Morrell is, to me, the finest thriller writer living today, bar none." "Splendid, state-of-the-art . . . action/adventure . . . Morrell's forte is action, and there is plenty of that here." "A wild thriller . . . exciting and entertaining." The surviving hero of The Brotherhood of the Rose meets the hero of The Fraternity of the Stone, making this novel a double sequel and the third book in a trilogy. But you don't need to know the other books to understand this one. Saul and Drew join forces to learn why old men are mysteriously disappearing. At first, the disappearances seem to have no connection to each other, but after Saul's father-in-law becomes one of the missing and Saul's village is attacked, it's soon evident that the sins of the fathers are being visited upon the sons. Readers often ask me why I didn't continue the series. My answer is in an afterword that I wrote for the Ballantine Books/Mortalis trade paperback, but here's a short version. The Brotherhood series is about orphans searching for a foster father. As a child, I'd been put in an orphanage, so it was natural that the theme of orphans fascinated me. But after my son Matthew died in 1987, I found myself writing about fathers searching for sons. I could no longer identify with the series. The trade paperback (and perhaps the e-book) includes a short story, “The Abelard Sanction,” in which I tie a loose plot thread (the motive for the attack on Saul’s village) that would have led to the fourth book in the series.